I believe so strongly that we get more out of every experience if we truly focus on the NOW, putting aside all distractions, that I chose “present” as my word for 2010. Present as in “being present” not as in “gift” although practicing being present is really a gift to myself. This design came out of reminiscing w/childhood friends about laying on the ground at dusk, looking up at the emerging stars. That was definitely an “in the moment” experience. Techniques used: hand-dyeing, discharge dyeing, screening. Social Worker, Sharon Weingarten, has a website that serves as an immensely useful tool for anyone who works with kids, has kids, or is a kid. What I Wish You Knew allows kids and parents to post messages that are often difficult to express, or difficult to hear, face-to-face. Every parent and child will be able to relate to some of these messages and perhaps begin to understand their own parent-child relationship a little more clearly. Communications skills are such an important piece of stress management and finding serenity. Meeting Sharon just happens to coincide with a related fiber art series I am beginning to conceptualize. While in Italy, I noticed that there was an abundance of graffiti. Italy’s graffiti however, was mostly not gang-related or, in any way, angry. Some of the graffiti I saw exhibited the talent of the graffiti artist. I would love to have a great range of messages, old and new. If you have a photo of your favorite Hebrew text and/or photos of graffiti that you would like to share, please send them to me (shelley@handmade-memories.com) along with your understanding of the message and – important – your consent for me to use your photos in this series of fiber art. Feel free to forward this post to anyone you know who may be interested in Sharon’s or my messages. Thanks. The most often-visited posts on my blog so far are the three on Reframing for Negative Thinking (May 15, May 27 and June 19, 2009). I have always believed that these tools really work, and I hope they are working for you! Just wanted to share that the first article in today’s NY Times Latest News was about a new program for the military to teach troops REFRAMING in order to help prevent/cope with Post Traumatic Stress, Depression and Anxiety. And here are 2 new pieces just finished for “Midwest Meditations”, a Fiber Artists Coalition exhibit which will start at the Bloomingdale Park District Museum, July – August, 2010. 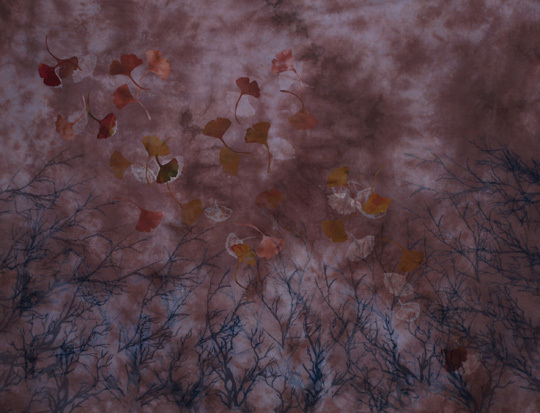 Fabric for both pieces is dyed, over-dyed, screened and discharged.